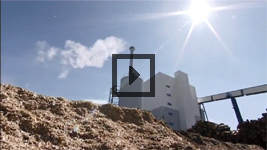 Biomass CHP (Combined Heat and Power) is a way of generating both heat and power from Biomass. Biomass is a renewable energy created from recently living material, such as plants, waste wood or animal fats. As it is a renewable energy, Biomass won’t run out, unlike fossil fuels, and is not weather dependent like wind or solar power nor water dependent like tidal power or dams. Using wood as fuel is one of the earliest forms of biomass. The burning wood is used to create heat. In a biomass CHP installation the steam created is used to drive a turbine, which then generates electricity. This form of generating power is up to 70% efficient, compared to approximately 40% for coal and gas fired power stations. This increased efficiency is because the heat created during the power generation process is used, rather than wasted like it is in a fossil fuelled power station. There are also fewer emissions created than in a fossil fuelled power station. CHP can be useful when a constant and reliable supply of electricity is needed all day every day. Hospitals, hotels and computer data centres are prime examples. Other industries can make use of biomass, and it’s very cost effective for buildings that use a lot of power and heat, such as factories and refineries. Paper and food processing plants can also benefit from this technology in terms of saving money, and the environment by being more efficient. Using this technology, the company or individual relies less on the national electricity supply. As more people follow suite, there is a reduced demand for electricity, which in turn will reduce the amount of fossil fuels used. Because this is a stable and secure way to create heat and power, Biomass CHP is suitable for countries that suffer from frequent power outages or have to import all their fossil fuels. The carbon footprint of the country and the individual business can be reduced, as there may be enough organic materials grown or harvested nearby. This helps to decrease the storage and transport costs. Biomass can be used in domestic applications too. Communities can share resources such as heat and electricity between many houses. Houses that are connected to this system won’t need boilers, as the water is transported using a grid of hot water pipes. Some of the electricity generated is used to keep the pipes heated, and the excess can be transferred to the national electricity supply. This entry was posted in News and Society on May 22, 2014 by admin_z.